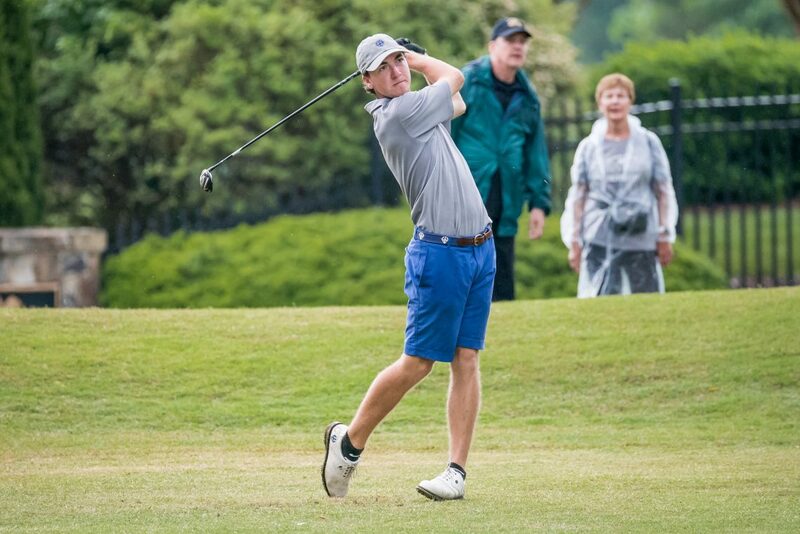 Washington and Lee sophomore Brian Peccie won the individual title and the Generals finished National Runner-up, as play finished at the NCAA Division III Men’s Golf Championship held at the Grandover Resort in Greensboro, N.C. on Friday. Peccie tied for first with Logan Young of Concordia (Texas), as both completed 72 holes at -3. Peccie posted a 71-69-69-76—285 and Young carded a 72-69-73-71—285. The playoff occurred in a downpour and both players made par on the par 5 18th-hole twice, before Peccie posted a third par on the par 4 10th-hole to claim the individual title. On the 10th, Peccie put his drive in the fairway about 185 yards from the pin. Young hit his drive into the rough and then put his second shot into a hazard left of the green, opening the door. Peccie’s second shot landed just shy of the green, about 25 feet from the pin. He chipped eight feet past the hole and drained the par putt to claim W&L’s first individual National Championship in the sport of golf and just the 16th individual National Championship in school history. As a team, the Generals produced the highest finish in program history with the runner-up showing. The prior best had been in 2016 when W&L tied for third overall. Methodist claimed its 12th NCAA title, finishing the championship at +7 with a 294-287-282-296—1159. The Generals completed the event with a 292-289-292-297—1170 (+18) to finish one stroke ahead of Texas-Tyler, which placed third. UT-T shot 296-287-296-292—1171 (+19). Washington and Lee featured several other solid individual showings en route to its second-place finish. Sophomore Boyd Peete carded a 72-74-73-74—293 (+5) to tie for 18th overall out of the 96 golfers that made the cut. Sophomore Sean Puleo and senior Luke Farley both finished in a four-way tie for 47th. Puleo shot 73-72-79-75—299 (+11) and Farley recorded a 76-76-74-73—299 (+11). Sophomore Robert Quinilty rounded out the Generals in the field with a 76-74-76-75—301 (+13) that tied for 54th. Following the tournament, Peccie was named a First Team All-American and he received the Division III Arnold Palmer Award as the National Champion. A complete list of the NCAA Division III National Champions from Washington and Lee is listed below.